A single bat can consume 3,000 insects in one night. Bats are the only mammals that are capable of flight. Bats help keep insect pests such as mosquitoes and moths under control. Twelve species of bats occur regularly in Illinois. They are all small, winged mammals, most weighing less than one ounce. The head and body are covered with fur, and the wings are constructed of hairless membranes (patagia) that connect the hind legs, body and long forelimbs. The wing membranes extend over the four fingers, but the clawed thumb remains free. Another membrane connects the small hind legs to the tail. All of Illinois’ bats are insectivorous. Since they hunt insects, they have a plentiful food resource during spring and summer. However, as cooler weather sets in bats must either migrate to warmer areas where they can continue to find food or find a place where they can hibernate over the winter to conserve their energy. Four of the 12 bat species may use buildings at sometime of the year in Illinois. For the full list of species found in Illinois, see the Habitat & Food section on this page. 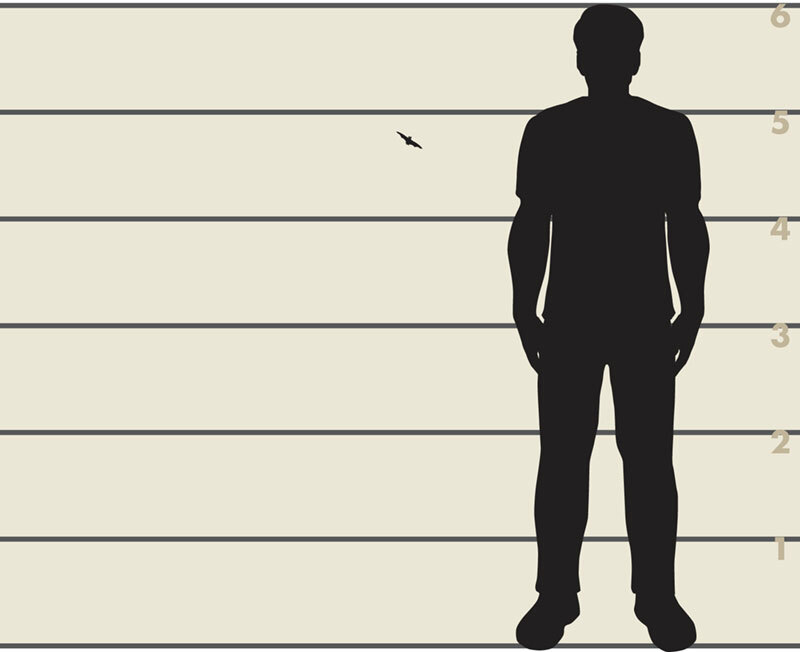 Size comparison of a six-foot tall man and a little brown bat. Bats are insectivorous, and eat a wide variety of insects. Bats eat huge quantities of insects. It has been estimated that a single bat may consume 3,000 insects in one night. Bats begin foraging for insects at dusk. After a couple of hours, they return to a roost to rest or nurse their pups. Foraging continues occasionally throughout the night with the final feeding occurring around dawn. These species are known to hibernate in Illinois. Little Brown Bat (Myotis lucifugus): Colonial. Both sexes roost together in caves and mines during the winter. Females form nursery colonies in hollow trees, under loose bark on trees, or in buildings during the spring and summer. During the summer males live alone or in small colonies, roosting in trees, in rock crevices, or under siding or shingles of buildings. During the fall, both sexes roost in trees. Northern Long-Eared Myotis (Myotis septentrionalis): Colonial. In winter both sexes roost in mines and caves. In the summer females form small nursery colonies in hollow trees, under loose bark or in little-used buildings. Males also will roost in caves during spring and summer. Indiana Bat (Myotis sodalis): Colonial. Both sexes roost in caves and mines during winter. During the summer, females form small nursery colonies and roost underneath exfoliating bark of trees. Males form small colonies during the summer and may roost in caves. This species is federally endangered. Southeastern Bat (Myotis austroriparius): Colonial. Roost mostly in caves, but also mines, tunnels, hollow trees, buildings, culverts and under bridges where caves are not available. This species is endangered in Illinois. Eastern Pipistrelle (Pipistrellus subflavus): Both sexes roost singly or in small groups in caves and mines during the winter. In summer, females form moderately sized nursery colonies (up to 50 individuals) in caves, cliffs or under the eaves of buildings. Males are solitary during the summer. Big Brown Bat (Eptesicus fuscus): During the winter both sexes roost in caves, tunnels, rock crevices, hollow trees, or buildings. Females form nursery colonies in hollow trees or attics during the spring and summer. Males are typically solitary during the early part of summer and roost in crevices in buildings or caves. Both sexes may be found together in roosts in late summer and fall. During the winter, some individuals of these species hibernate in Illinois while the rest migrate to adjacent states or farther south. Gray Bat (Myotis grisescens): Colonial. Roost in caves year-round. This species is federally endangered. Eastern Red Bat (Lasiurus borealis): Solitary. Roost in trees in both winter and summer. In winter, they use crevices or hollow trees. In summer, they can be found hanging from the outer limbs of trees. In spring and fall, they sometimes use shrubs or tall weeds as a roosting spot. Silver-Haired Bat (Lasionycteris noctivagans): Small colonies. Roost under bark and in tree cavities in wooded areas. May occasionally occupy buildings or caves during the winter, though most migrate south. Rafinesque’s Big-eared Bat (Corynorhinus rafinesquii): Colonial. Roost in caves, mines, and buildings. Unlikely to over-winter in Illinois. This species is endangered in Illinois. These species are typically not found in Illinois during the winter. Hoary Bat (Lasiurus cinereus): Solitary. Roost in trees, usually in the foliage, but occasionally in cavities. Evening Bat (Nycticeius humeralis): Colonial. Roost in trees or occasionally in buildings. The droppings of bats and mice are fairly easy to tell apart. Mouse droppings will be small, hard, cylindrical pellets that are generally scattered about. Bat guano will have a shiny appearance and be brittle due to the remains of insects. The guano will usually be found in piles near the roost. 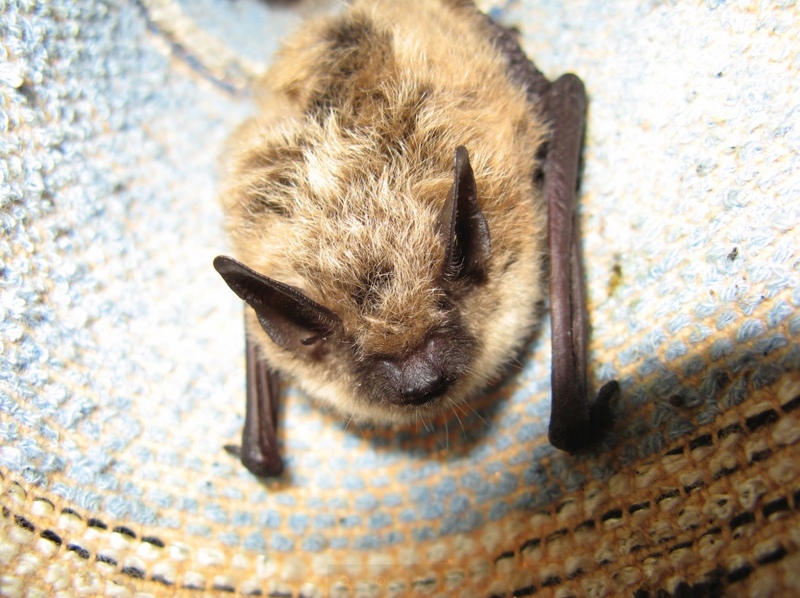 Big brown bats, little brown bats, Northern Long-eared Myotis, Eastern Red bats and Eastern Pipistrelles are common throughout Illinois. Some of the other species of bats have limited distribution or are relatively uncommon in the state. The cave regions of southern Illinois and the valleys of the Mississippi and Illinois rivers probably have the highest abundance of bats and natural bat habitat. Bats are the only mammals that are capable of true flight. Some species of bats are stronger fliers than others. All are nocturnal (active at night) and hunt for insects. During the day bats roost (rest) hanging upside down or tuck themselves into a small crevice where they are protected from weather and predators. Bats use echolocation to orient while flying and to help them catch their prey. A bat uses its mouth and larynx to emit ultrasonic sound pulses. Once the sound makes contact with an object in the surroundings an echo is bounced back and is received by the bat. Using the echoes the bat can determine the size and shape of an object, how far away it is, which direction it is in, and whether or not the object is moving. The bat then uses this information to avoid obstacles in its flight path and to hunt insects. The sounds that bats emit are at such a high frequency that humans cannot hear them. Despite common misconceptions, healthy bats do not attack humans. Bats may bite as a defense if people attempt to handle them. Despite educational outreach efforts, many myths still exist about bats. Most species have declined because of loss of habitat, and in some cases, because of human persecution. Bats are an important predator of insects and help keep insect populations under control. Guano deposits in some caves have been mined for fertilizer. Like all mammals, bats are livebearers and nurse their young (called pups). Depending on the species, females give birth to 1 or 2 pups each year, usually in May or June. The Eastern red bat gives birth to 3 to 5 pups. Bats do not build nests. Some species form groups of females (maternity colonies). A typical summer roost could be beneath loose tree bark, in hollow trees, in abandoned buildings or attics, or in caves. At birth a young bat clings to its mother. When the mother feeds each evening, the young bat is left at the roost site. After about three weeks, the young can fly and will start feeding on insects, but they will continue to nurse until they are about one and a half months of age. In Illinois, three to five percent of the bats tested each year have rabies. Rabies is usually fatal if not treated. Care should be taken to avoid contact with bats. Bats have few parasites and those found on bats do not normally infect humans. Stay calm. Do not knock the bat out of the air and do not attempt to handle or catch the bat. In an enclosed area a bat will make sharp turns while flying and may appear to swoop down at you. The bat is not trying to attack you, it is simply trying to get its bearings so that it can find its way back outside. Confine the bat to a room with outdoor access. Close doors to keep the bat confined to one room. In the room where the bat is, open a window or door to the outside and leave the room. Allow the bat time to escape (this may take a few hours if the bat is disoriented). Keep children and pets out of the room until you are sure the bat is gone. Bats can have rabies. If the bat bites a human or a pet, do not allow the bat to escape, keep the bat enclosed in the room. Call the local Department of Animal Control to have an officer capture the bat. If the bat has bitten a human or a pet it will need to be tested for rabies. If a bat has been near sleeping people, especially children, it should be tested for rabies. Bat bites are small, and the person may not realize that they have been bitten. It is better to err on the side of caution and have the bat tested. Testing is done on the dead bat’s brain so it is important not to damage the carcass before testing. If the bat tests positive for rabies, medical attention is needed. A series of rabies shots will need to be given. A bat found on the ground is likely a sick or injured bat or a pup that is just learning to fly. When a bat is on the ground it is very vulnerable and may be aggressive. Do not attempt to pick up a grounded bat. If children or pets are in the area it is better to remove a grounded bat so that they do not come into contact with it. Wear a pair of leather gloves, place a plastic bowl or coffee can over the bat to capture it, and slide a piece of rigid cardboard underneath. Keep the cardboard held firmly to the bowl as you pick it up. If the bat bit a person or pet keep the bat for rabies testing and call the local Department of Animal Control. If the bat did not come into contact with humans or pets, release the bat at the base of a tree away from children or other animals. Place the bowl on the ground and slowly slide the cardboard out. Quickly remove the bowl and walk away from the bat. If the bat is healthy it will soon gain its bearings and crawl up the tree. During the spring and early summer bats may set up maternity colonies in buildings. 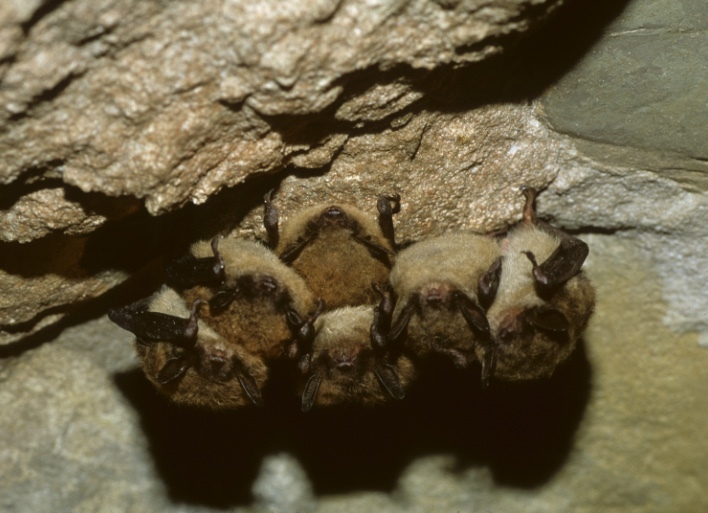 During the winter bats may hibernate in groups in buildings if natural shelter is unavailable. If at all possible, let the bat colony remain for the season. If the colony cannot be tolerated, CONTACT an Illinois Department of Natural Resources district wildlife biologist for advice on how to deal with the colony. Bats, like most wild animals, try to avoid human contact. However, due to loss of their natural habitat, bats may establish roosts in attics or abandoned buildings. The best way to avoid contact with bats is to exclude them from buildings on your property. If you wish to attract bats to your property to help control insect populations, but do not want them living in buildings on your property, consider providing bat houses. Bat houses can be purchased or you can build your own. Bat house plans are available from several organizations including Bat Conservation International. It is better to prevent bats from entering buildings in the first place by sealing any holes or gaps. However, if bats have already taken up residence, watch the exterior of the building from dusk (half an hour before sunset) until it gets dark outside to determine the entrance(s) to the roost site. Bats typically enter buildings through openings in the roof, eaves, dormers or gables, via the chimney, attic or roof vents, and holes or gaps in siding. Seal all gaps of 1/4 x 1 1/2 inches or holes 5/8 inches diameter or greater. Seal minor points of entry first. After bats leave the roost in the evening, temporarily seal all major entrances with a one-way door made of wire or plastic mesh. One-way doors can be made of 1/4 inch wire screening. Use a 2- to 3-foot piece of wire to cover the hole (there should be 3 to 5 inches between the structure and the wire to give the bats room to crawl out). Secure the top and sides of the wire to the building using staples or duct tape. Leave the bottom section open. After all bats have left the building (this may take several nights) permanently seal all openings. One-way doors should be in place before the young are born in May and June to prevent the young from starving after the mother has been excluded from the site. If there are young bats inside the building, wait until they are weaned (late July-August) before excluding the bats and sealing all entrances. Bat Conservation International provides good information on exclusion techniques. There are not any repellents for day roosts, but if bats roost briefly on porches or other structures at night, dog or cat repellent sprays can keep them away. Spray the area before the bats come to roost. Bats are protected in Illinois and cannot be removed without a PERMIT. If removal is needed, it is best to hire a nuisance wildlife control operator that has experience with bat removal and exclusion. In Illinois, bats are protected under the Illinois Wildlife Code. They may not legally be removed without a PERMIT from the Illinois Department of Natural Resources.